It’s been quite a while since I wrote a book review, so I thought I’d give you two. 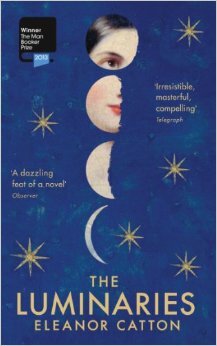 Over the summer I bought myself a copy of The Luminaries by Eleanor Catton. Winner of the Man Booker Prize in 2013, the blurb appealed to me – in 1866 a chap goes to New Zealand, stumbles upon a secret meeting of twelve men and there’s a mystery to solve centring around a wealthy local man who has vanished, a fortune discovered in a drunk’s cabin and the attempted suicide of a prostitute. Sounds like a nice, potentially complex plot. I love historical novels, and I love a good old mystery, what’s not to like? 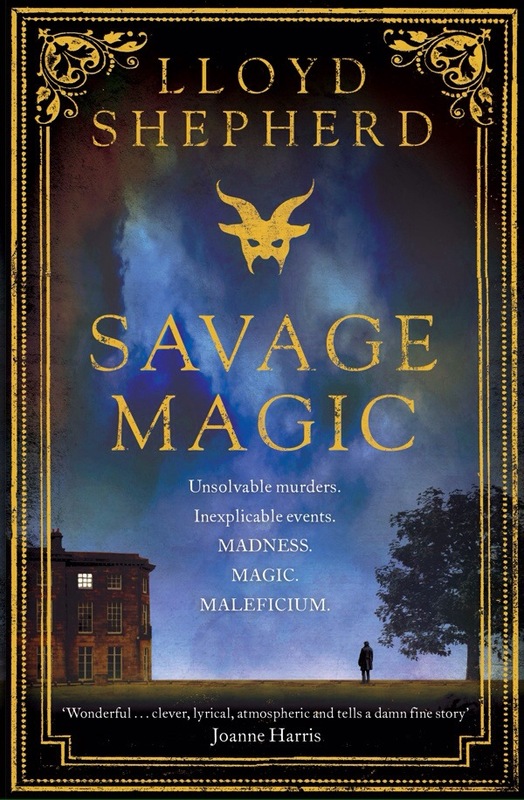 At roughly the same time my husband also treated me to Lloyd Shepherd’s third novel Savage Magic. Set in 1814, Charles Horton steps from Shepherd’s previous novels to investigate the murders of a number of aristocrats, all wearing satyr masks, all behind closed doors and with no signs of forced entry. He is also sent to the country, where in Thorpe Lee House accusations of witchcraft have sent a family into despair, while his wife has voluntarily entered an asylum to help her cope with the repercussions from Shepherd’s last novel The Poisoned Island. Again a nice, potentially complex plot set in the 1800s. Now I’ve read Lloyd’s other books so I knew what to expect, so I decided to give The Luminaries a read first. I’m not a fast reader when I’m not working, but even so it took me two months to read the 832 page doorstop. As the book started the first thing that sprang to mind was that the narrative reminded me of Wilkie Collins, the Victorian novelist. I like Victorian novelists’ work, so all well and good. However, the pastiche got tiring and I struggled to reach page 100. The Victorians wrote the way they did because it was natural to them… this just seemed too forced. Pages of words that said nothing to move the plot along. A quick scan of Twitter made me realise I wasn’t the first to struggle; it seemed to be a common theme among readers, many never even reaching page 100. Nevertheless I persevered. I know I’ve said before that life is too short for boring books, but this really did have potential, it can’t have won an award for nothing – so I plodded on. And I plodded and I plodded (just another fifty pages more and it might get better… and another… and another) until I finally reached the conclusion of the story. With more than twelve main characters weaving their way around the mystery, this story had the potential to be wonderful, but switching between all the characters just got too messy, we never really ‘knew’ them; fewer characters would have led to the reader feeling more for the story and its players. Personally I felt that, even with the huge page count, we just never got to know the characters intimately enough to care for them. By the time I reached that final page the feeling was more of an ‘oh, ok’ than a feeling of closure that usually comes with the end of a good book. I also did not miss the characters at all once the book was put down. I’d say, in all honesty, that this book is probably 50% too long. Savage Magic is, however, a different thing all together. Seemingly without trying Shepherd transports us to Wapping in 1814, then guides us through a London teeming with life and outwards into the Surrey countryside, stopping off in a deliciously Gothic Victorian asylum. There is no flowery, overly descriptive language, just a mysterious story told well. Readers of the author’s previous work will no doubt be glad to see the reappearance of River Policeman Charles Horton and his wife Abigail. As previously, Shepherd is not afraid to show us the dark side of life, and the story rolls well until the very end. Mixing fact and fiction, we delve deep into secret societies, magic, witchcraft and the treatment of the mentally troubled. Atmosphere is created organically, you can almost smell the stench of the streets and the hear the bustle of Covent Garden before being subjected to the claustrophobia of Brooke House, its wealthy inmates locked in for the night. I can’t say much about the book without ruining it for any potential readers, but every page has a reason and every phrase takes you deeper into the story. So, here we have two books, set roughly fifty years apart. Both deal with mysterious deaths, the unexplained, and prostitutes and are atmospheric in their own ways. The first is, for me, heavy going, a pastiche on the Victorian mystery novel complete with chapter summaries and pseudo-Victorian language, and while I struggled to finish it, I wouldn’t not recommend it, I would just say perhaps give it a chance… there is a good story hidden in there. At the moment if you visit the publisher’s website you can read the first chapter for yourself. The second of the two is an atmospheric meander through a rapidly changing London, we rub shoulders with toffs and tarts, investigators and instigators, and every minute spent in Shepherd’s world is a joy. I look forward to Lloyd Shepherd’s next book (please tell me there is another one on the cards), but I perhaps will sample before I buy Catton’s next tome. Both are available from the publishers, Amazon, other online retailers and your lovely local bookshop. Fancy that second one, but think I’ll give the first one a miss lol! I am so glad I read this. I picked up The Luminaries twice in the bookstore and, whilst I am not daunted by its length, there was something about the story itself I couldn’t quite commit to. But, like I you, I thought about the awards and how deserving it must be. Now I will not shell out the money for it. I quite like long books… IF they are any good. You may well enjoy it, but just by picking it up twice and not committing I’d say go for something else that does appeal. There are loads of books out there that may never win awards but are worthy of a read. Mantel wins loads of awards and I can’t get into her books either! I found her constant use of colons in Wolf Hall so off-putting I gave up after 100 pages. And I found I just didn’t give two hoots for her characters…shame because I know the history of the era. Still, variety is the spice of life!